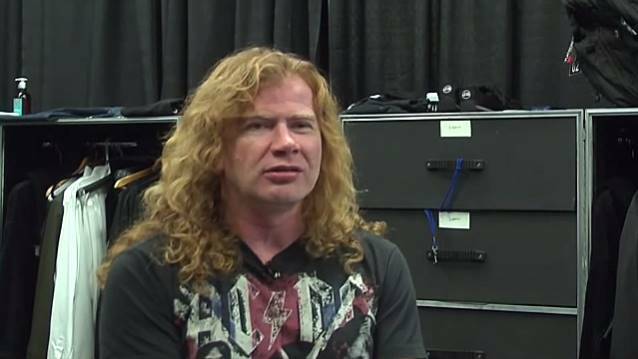 MEGADETH mainman and longtime Shure user Dave Mustaine recently talked with Shure about the group's new record deal, his first time he picked up a guitar, and what his relationship with Shure means to him. You can now watch the chat below. Warner/Chappell Music, the music publishing arm of Warner Music Group, announced in November 2013 that it had signed a worldwide publishing agreement with Mustaine. Warner/Chappell will administer Mustaine's songwriting from MEGADETH's recently released album "Super Collider", as well as future songwriting. In 1983, Mustaine founded MEGADETH and, in 1985, they released their first album which established the band as pioneers in the thrash metal movement. The band has since sold 50 million albums worldwide, including five consecutive platinum or multi-platinum albums in the U.S., while garnering 11 Grammy nominations. The band's 14th studio album, "Super Collider", was released this past summer and debuted at No. 6 on The Billboard 200 album chart. It was the first MEGADETH album to be released via Mustaine's own imprint, Tradecraft. Prior to MEGADETH, Mustaine was an early member of METALLICA. Before leaving the band in 1983, he had co-written a half dozen songs that would appear on the band's first two albums. In the video game arena, Mustaine composed the Grammy-nominated MEGADETH track "Sudden Death" for the 2010 release Guitar Hero: Warriors Of Rock. The game also featured two other Mustaine-composed MEGADETH songs: 1990's "Holy Wars… The Punishment Due" and 2009's "This Day We Fight!" Noted rock author/journalist Joel McIver ranked Mustaine No. 1 in his 2009 book, "The 100 Greatest Metal Guitarists", and 2010 saw the publication of Mustaine's New York Times bestselling autobiography, "Mustaine: A Heavy Metal Memoir". Mustaine is also the organizer of the traveling heavy metal music festival known as Gigantour. Throughout MEGADETH's various personnel changes over the years, Mustaine has remained the band's sole constant member.